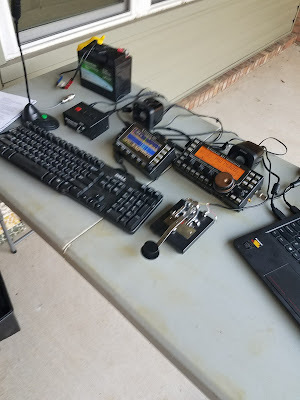 My goal is to build a QRP station for Winter Field Day in January and the ARRL Field Day in June. 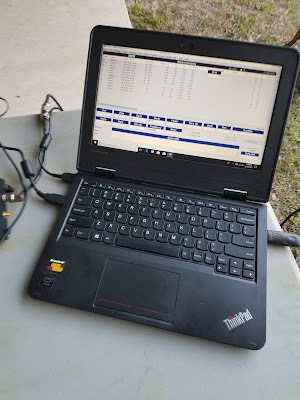 QRP or low power is 5 watts max for all modes during ARRL Field Day. 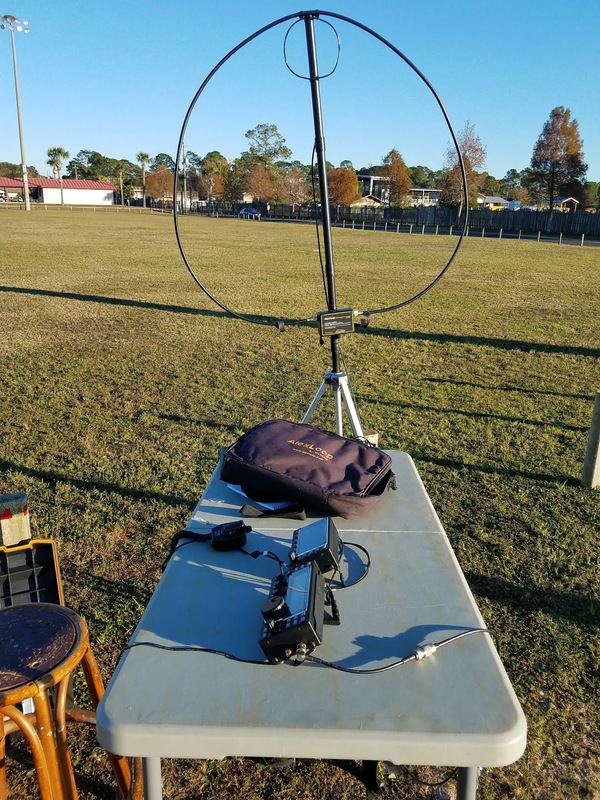 Winter Field Day allows 10 watts peak for phone and digital. I like that. I don't think 5 watts is a problem on CW. However, on phone, it is a challenge. I have never used PSK-31 on Field Day so that will be a learning curve. It helps to test the station set up in advance. The hub of my station is the Elecraft KX3 transceiver. 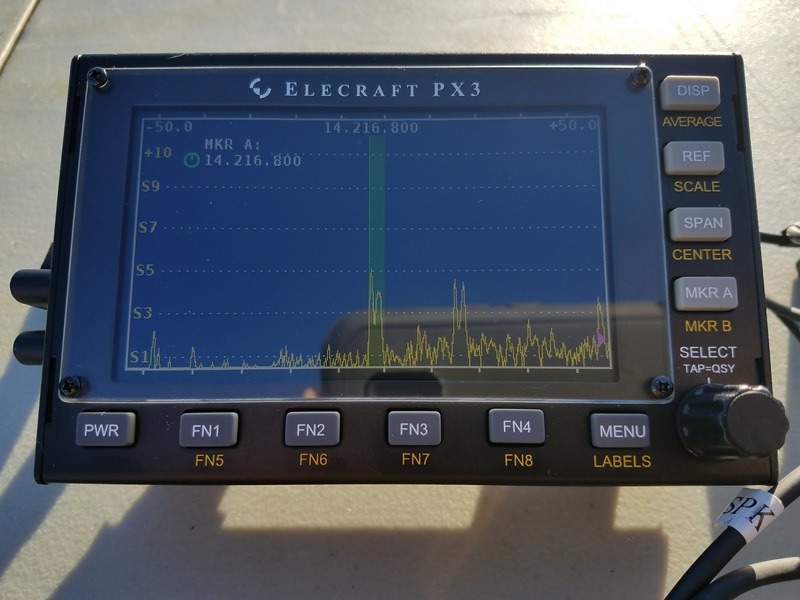 A new addition is the Elecraft PX3 spectrum scope. Now add a computer and logging software, and you have a few things to integrate. My choice for logging software is N3FJP as they have a specific log program for Winter Field Day. The Elecraft PX3 is excellent. Amazing how it integrates with the KX3. In my opinion, it gives you more capability than the spectrum scope on the Icom 7300. I like the way the markers work to let you QSY. Of course, there are buttons and features to learn on the PX3. And yes you can hook up a keyboard to the PX3. This enables you to type or use text macros for CW or PSK 31. This leverages on the built-in capability for these modes in the KX3. It is cool that the KX3, PX3 and the computer logging program all talk without any issues. I also tried using the N3FJP software to generate CW for the first time. I bought a used WinKey box on eBay. The N3FJP software uses it to key the KX3. The WinKey also lets you hook up a paddle or straight key to go manual if you like. We will see how that goes. I am leaning toward using the PX3 keyboard do most of the work. That way I can have someone else assist with the logging on the computer. I guess you can tell this is overloading my 8-bit brain. It will take some practice in the field to burn it in.. I have some opportunities operating portable for ARRL Grid Chase starting New Years Day 2018. Winter Field day is January 27/28. I have a reservation at a campsite in Falling Waters State Park near Chipley Florida. 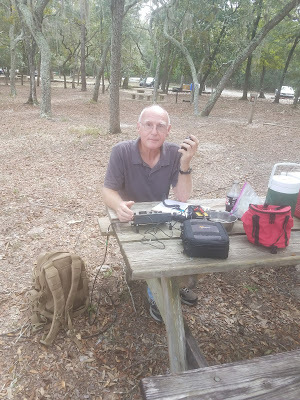 I have some friends planning to share the experience including Bob KK4DIV who is camping in the same park. I got inspired to create an online Portable Activation Guide for sites nearby Panama City Florida. Click on this link or the image. This Portable Activation Guide is an aid to local and visiting hams in the Panama City, Florida area. Use it to choose a site and an activation program for your outing. We are blessed with many beautiful sites nearby. 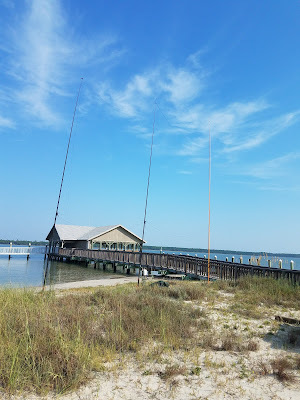 Some are on the saltwater gulf or bay which can enhance radio propagation. Our weather allows activations year round. 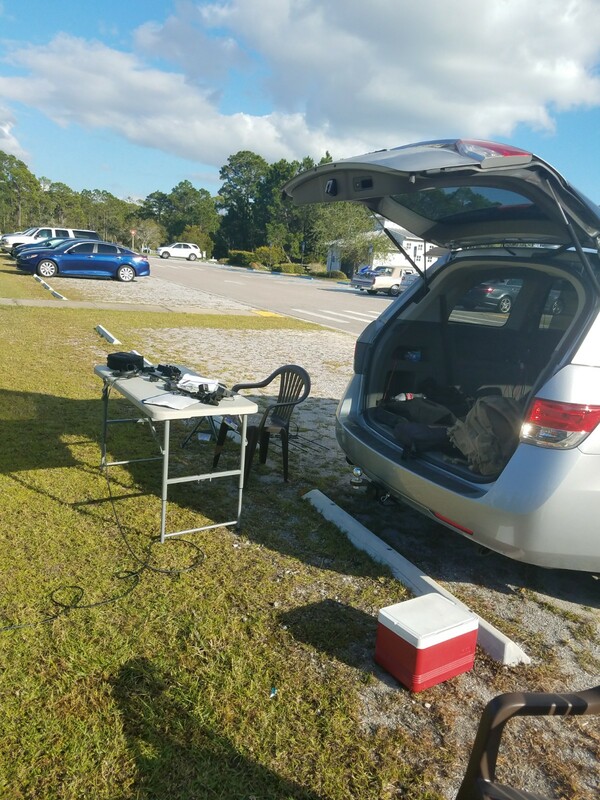 I am happy to report that the plan, the weather, and the radio propagation came together nicely for the November 4th, 2017 RaDAR Challenge, RaDAR is Rapid Deployment Amateur Radio. It originates with Eddie Leighton ZS6BNE in South Africa. I was pleased to have Dennis WA6QKN as a teammate. 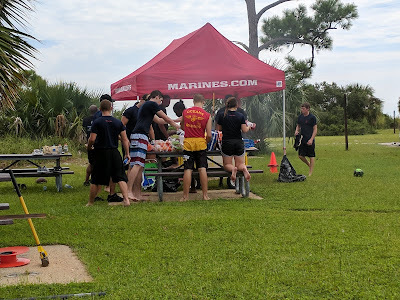 Our venue was St. Andrews State Park near Panama City, FL. We operated at four locations within the four hour period. 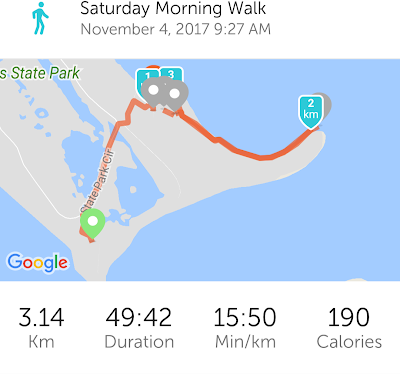 We traveled one kilometer by foot between locations. It was necessary to make five contacts before moving to the next stop. Location 1 was the parking lot at the Jetties area. 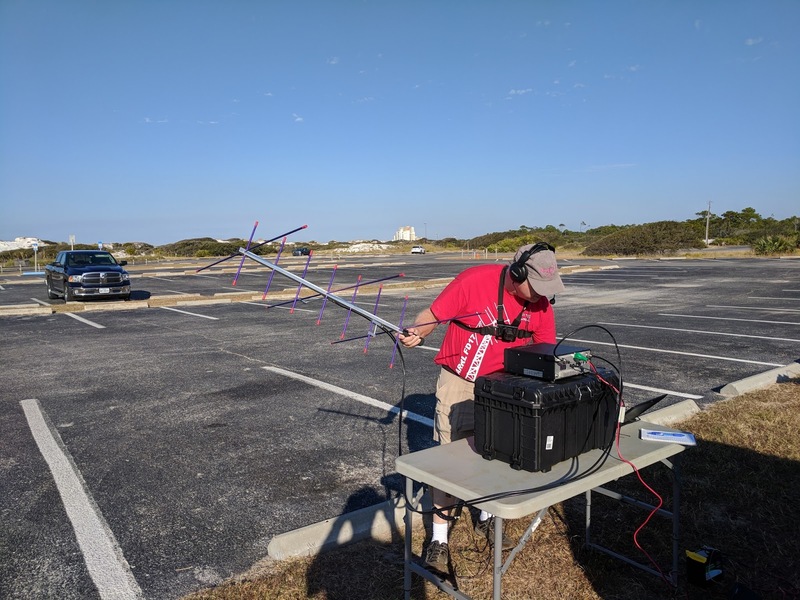 I chose to take a gamble and do an FO-29 satellite pass. I felt it was a gamble since I have not been too active on satellites lately. Fortunately, I made nine contacts. Among the contacts were Bob KE4AL in Dothan and Chris VA3ECO in Ontario. They had a heads up I was on satellite. Chris is my Elmer for linear satellites. Location 2 was one kilometer North at a clearing near the turpentine mill. I chose 40 meters. 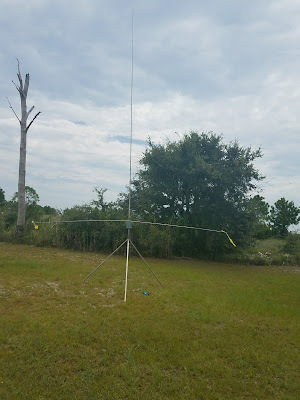 Dennis and I erected a 40-meter dipole supported by three ten-foot fiberglass poles. The rig was the KX2 running ten watts.The low dipole supports NVIS. 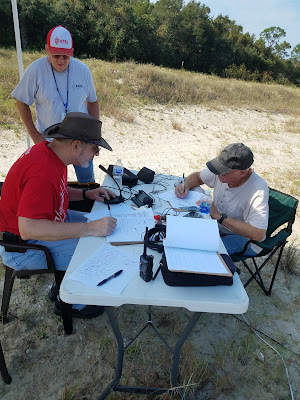 We were able to work Tom WD0HBR and Don K1DC my friends in Dothan, Alabama 75 miles away on CW. 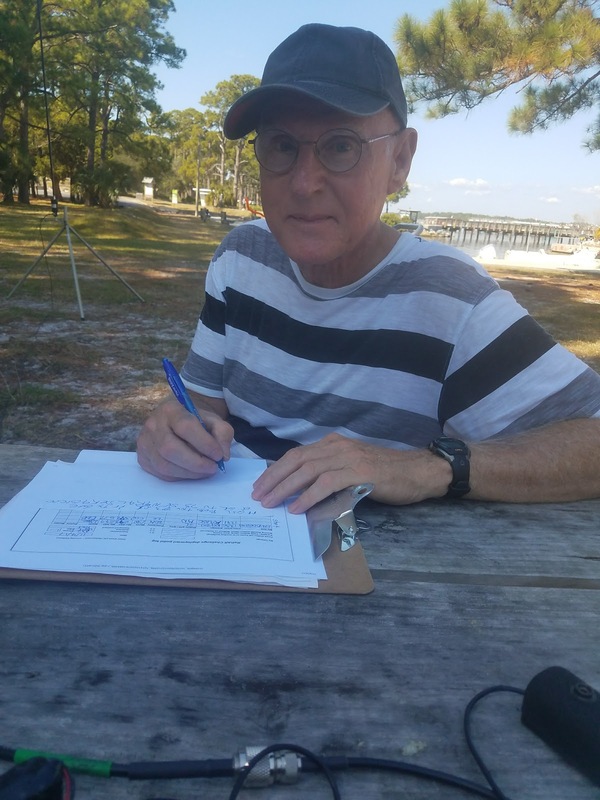 We got a couple more CW contacts and worked Don KK4DWC in Southport on SSB. Location 3 was Sandy Point. It is on the Grand Lagoon shore and gives us a wide azimuth over saltwater. I chose the Chameleon whip with transformer and two counterpoise wires for vertical polarization. Verticals on the salt water are always a great performer. We operated 20 SSB. We picked up Jim K4LIX local and four more. Two were in Canada including Chris VA3ECO. We had roughly 45 minutes left in the four hours when we packed up. Location 4 was the picnic area still near Grand Lagoon. We chose the Chameleon vertical again. 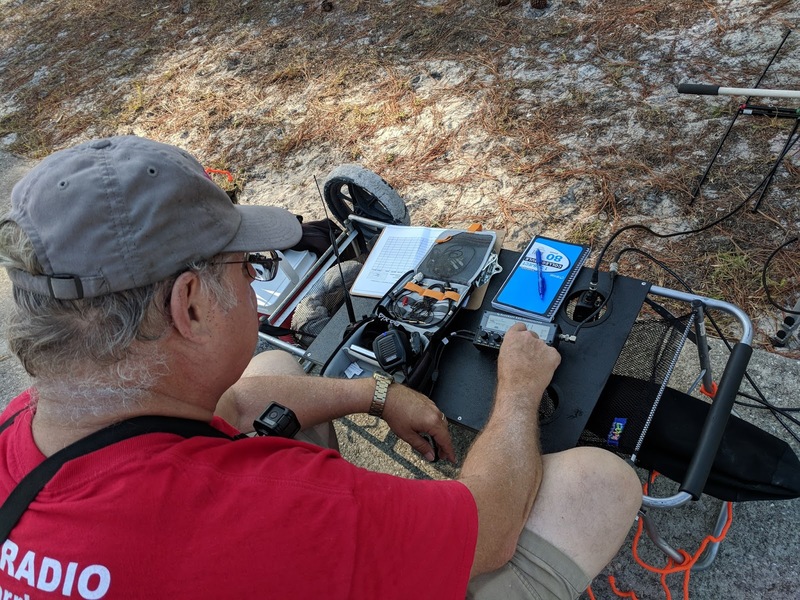 I spotted us on DX Summit as WWFF KFF-1917. It created a pile-up which was just what we needed on 20-meter CW. The chasers included two stations from Spain, one from Canada and Joe N2CX who was at a park in New Jersey. I often make three locations in the four hours and am struggling to make the fourth. This time we made four which is par for the course. I think Dennis made the four locations possible with his help with the gear. We took turns pulling the cart. Maybe RaDAR on foot is a little like golf. We did enjoy four great venues in one outing. The only thing we lacked was a RaDAR to RaDAR contact. Tom G0SBW heard us in the UK but missed working him. There were a number of other RaDAR operators active. You can find their reports on the RaDAR Community on Google+. Welcome back to Lucy M6ECG! 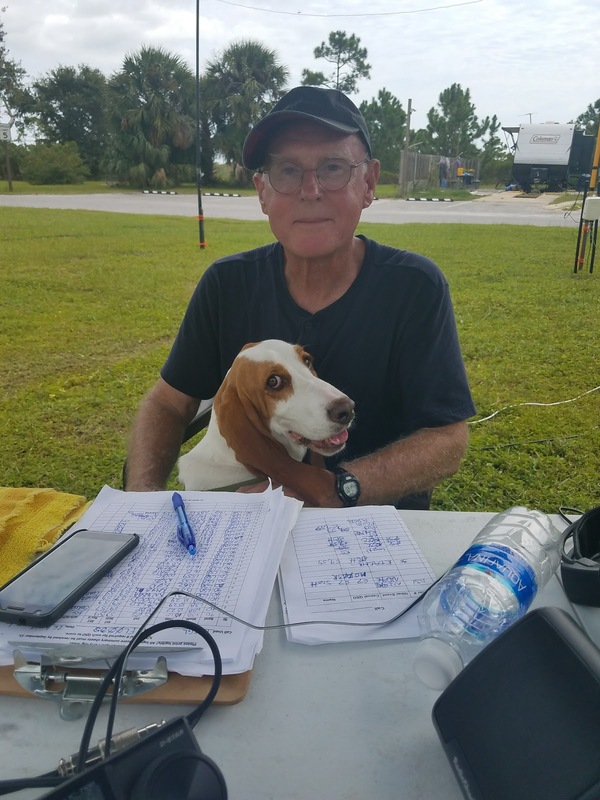 RaDAR is Rapid Deployment Amateur Radio. Dennis WA6QKN and I will be teaming up for the Nov 4th RaDAR Challenge. 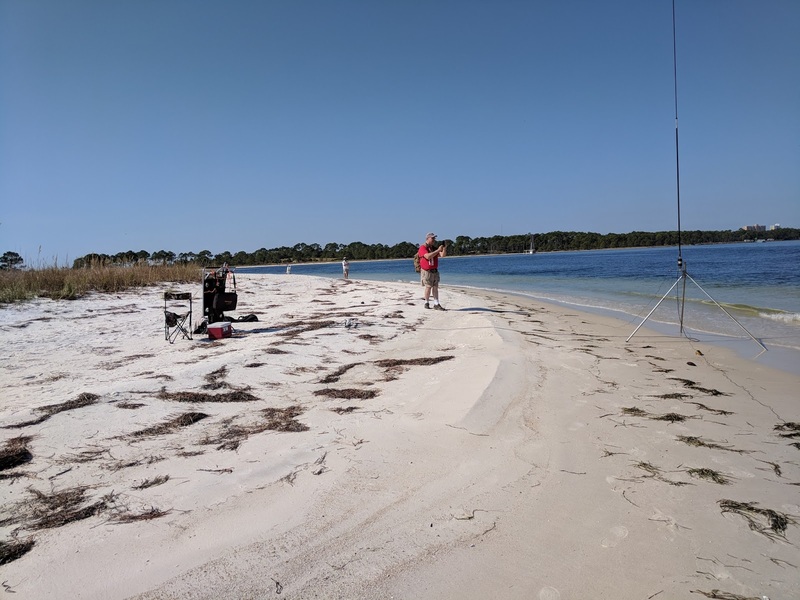 We have chosen to operate at St. Andrews State Park near Panama City, FL from 1400 - 1800 UTC or 9 AM to 1 PM CDT. We will set up portable and make five contacts. Then we will walk at least one kilometer to the next location. 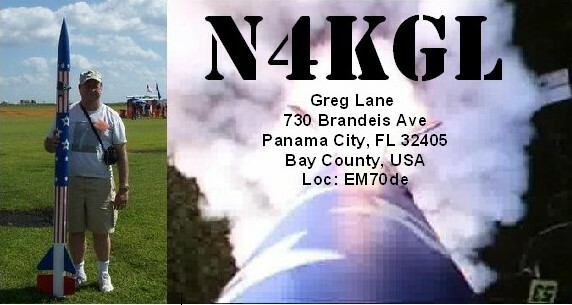 As a team, we will combine our contacts so both WA6QKN and N4KGL call signs count. The exchange is RST, name and grid square. If grid square not known QTH will do. See the rules at http://www.n4kgl.info/2017/10/get-ready-for-november-4th-2017-radar.html All chasers welcome and appreciated. The first stop will be at the parking lot near the Jetties. Pin A on the photo. I will operate the FO-29 Linear satellite pass using N4KGL call. Dennis WA6QKN will be on 146.565 FM Simplex as these simplex contacts count. While we transition we will monitor 145.210 W4RYZ repeater. The second stop Pin B on photo will be near the boat ramp on Grand Lagoon in the second hour. I will start on 40 meters HF see frequencies below. I will work my way down the list as needed. It is an anyway which way we can situation to make contacts. So bear with us. For local ops 146.565 FM simplex is good at each stop. The third stop Pin C will be at Sandy Point in the third hour. I will start on 20 meters HF and work up. Additional stops are a maybe. We might even keep going after four hours. St. Andrews State Park is POTA KFF-1917. Watch for spots on DX Summit. If you are operating portable or chasing give me a heads up. RaDAR to RaDAR is a top priority. For the first time, I will do a team effort for the RaDAR Challenge. Dennis WA6QKN and I will use our own calls and combine our contacts. We will make at least five contacts together and move by foot to the next location. We will only take credit for contacting a station once per band per mode. 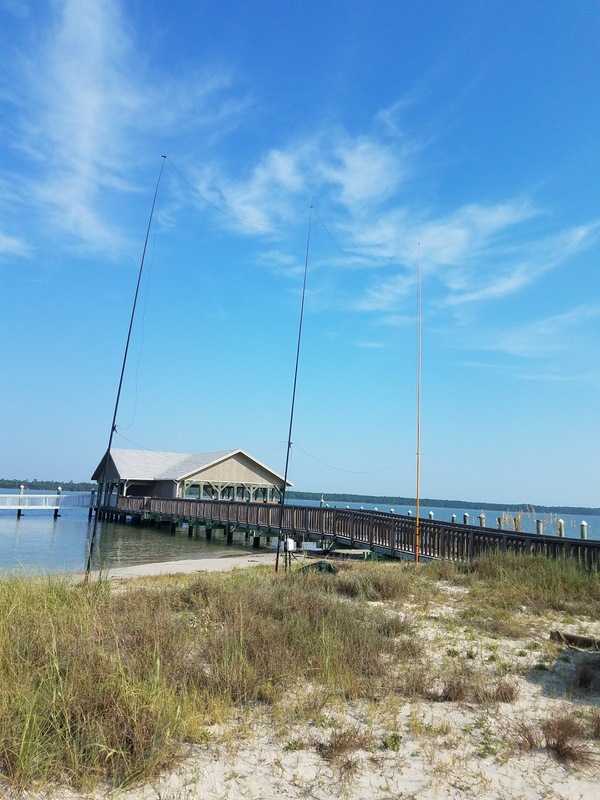 We may run a VHF station and HF station concurrently. This team effort is an experiment and perhaps the rules can be amended in the future to account for RaDAR teams. 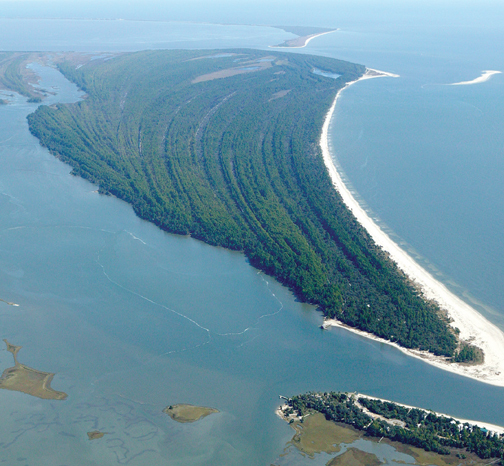 Our chosen site is St. Andrews State Park near Panama City, FL. I have shown three stops A, B & C on the photo below. The distance between them is one kilometer. We will progress through the stops A-B-C-B-A as far as we can in 4 hours. The four hour period will be 1400 - 1800 UTC. We have the option to extend our outing and keep going after the four hours if we like. RaDAR transitions over 24 hours count for the special WWFF-KFF POTA RaDAR Awards. The park is reference KFF-1917. I will return the sat gear to the van after the pass. 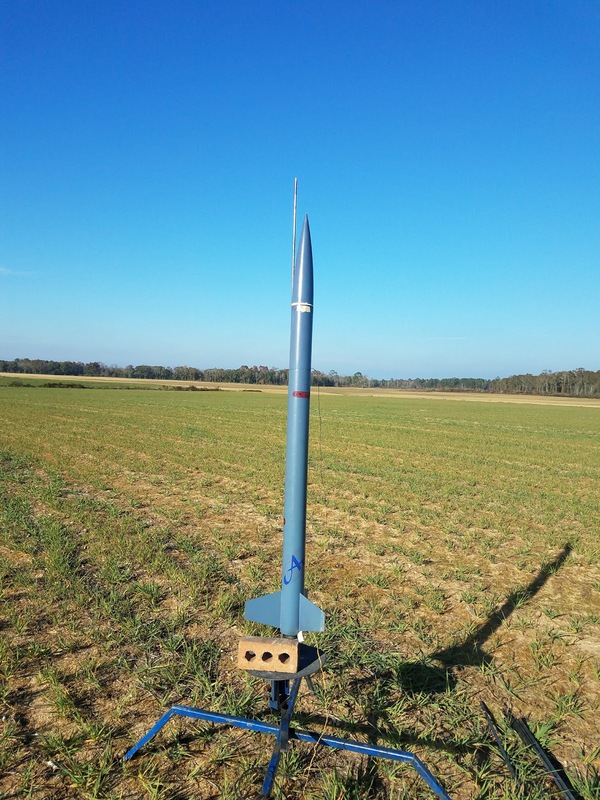 The 1st sat contact will count as a bonus. We will rely on a KX2 at ten watts on HF. The HF antennas will include a low 40-meter dipole with 10-foot poles, an N6BT Bravo 7K vertical and an Alex Loop magnetic loop. I have a beach cart to carry the antennas that will double as a table. 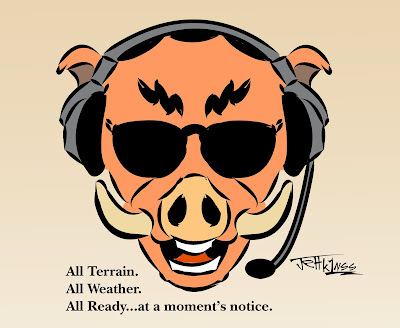 I provide more details to coordinate local and RaDAR to RaDAR contacts as we get closer. Good luck to all participants and chasers. Be Safe! Last Saturday, Dennis WA6QKN and I drove over to Rocky Bayou State Park near Niceville, FL to meet up with Tom WD0HBR. Tom had some time in the area while his wife Sandy took a class in Valparaiso. Tom had found a spot in the picnic area that overlooks the bayou. The area is under many oak trees. 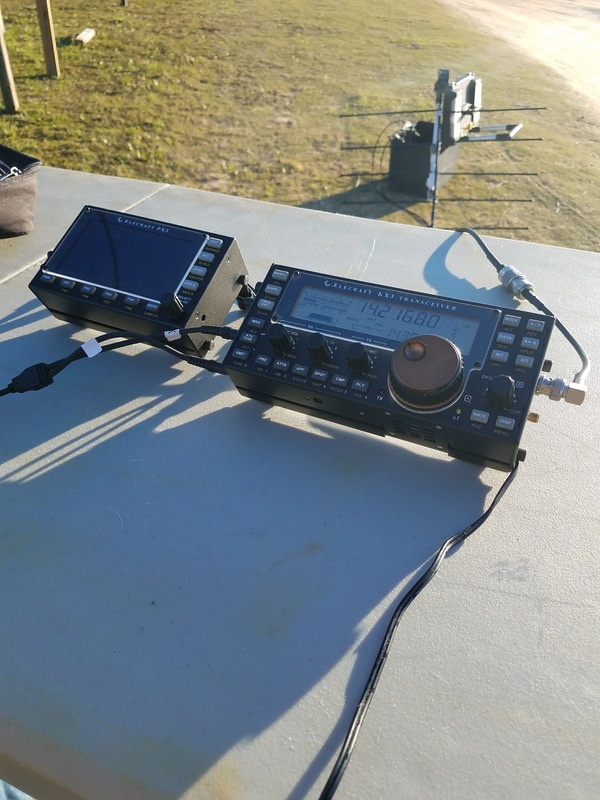 Tom set up his Youkits HB-1B with a random wire antenna. Dennis and I set up my Elecraft KX3 with a 40 meter Off Center Fed Dipole (OCF). The OCF had very low SWR on 40 meters and between 2 and 2.5 to 1 on 20 meters. The OCF is a popular one from China via eBay. Dennis was interested in my KX3 since he has one on order. I managed to make a dozen contacts which is enough to activate the park for Parks On The Air (POTA). Dennis took lots of great photos in this album. It was nice to do portable ops with a couple of friends. Suzy. She enjoyed lunch and a walk! 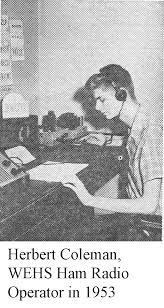 One of my teenage ham radio memories was a program on Alabama Educational Television. The program was received at my Dothan, Alabama home directly from WDIQ Dozier, Alabama about 60 miles away. There was no cable back then. The show played a part in my getting my license or at least increasing my knowledge of amateur radio. It was wonderful that ham radio had an on-air TV presence.The format of the show was a segment on electronics theory followed by a segment of Morse code. This is me back in the 60's. A few years before getting my ham license and Novice call WN4JFW. I give the show credit for there being so many active hams in our area. That and, of course, the fact that “ham” is BirmingHAM, Alabama’s middle name! Later I enjoyed teaching classes in morse code and electonic theory for obtaining an amateur license. A highlight for me was having the opportunity to teach morse code and electronic theory on public television during the late '60's and early 70's. The program was called "Electronics and The Radio Amateur". A deeper Google search yielded this picture of Herb. I am pretty sure it is the same, Herb. It is from West End High School in Birmingham. Herb is now retired and living in Mobile, Alabama. He had a lot to do with the engineering side of TV in Birmingham. I certainly appreciate his help to educate me about electronics and ham radio. I still hold out for a clip of the show on video. I hear there are none. Still, I search YouTube. Hi Hi! I received an email from Herb Coleman W4AVX himself. He was complimentary of the post. Herb confirmed the picture above is him. This memory chase went right back to the source. Thanks, Herb! I operated from Topsail Hill Preserve State Park near Miramar Beach, Florida on Saturday, October 14th. The park is POTA KFF-3664. I originally was going to the rocket launch in Samson, Alabama. I replanned when my wife was asked to work in Miramar at the last minute. The volunteer taking my money saw my Field Day T-Shirt and was very in tune with ham radio and emergencies. I was not too ambitious and worked right out of the parking area using the van for shade. The rig was the Elecraft KX2. 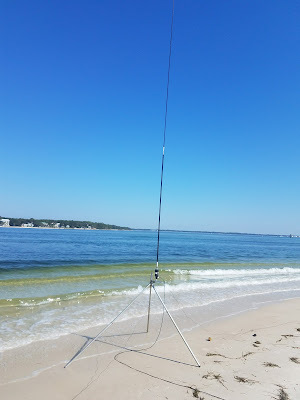 I chose to use the Bravo 7K vertical antenna. It requires no trees or stakes in the ground. I got weak reports on 40 meters but it did OK on 20 meters. 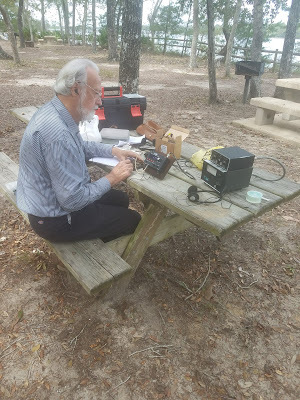 At first, I was targeting the QRP ARCI Fall QSO party but did not hear much activity. I ended up working two other POTA stations. The rest was a hodgepodge of including FISTS and NAQRPCC anniversary stations. I heard DX activity on 10 meters SSB but no luck. 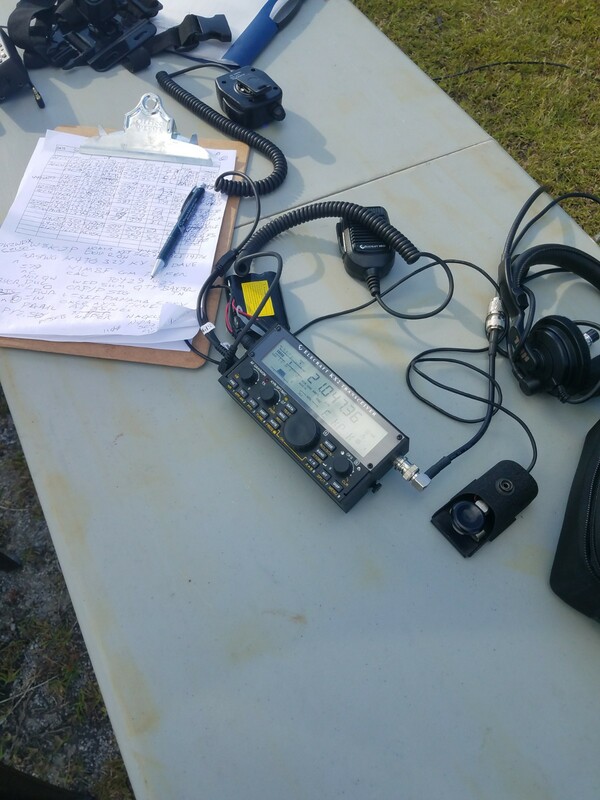 I did snag one station on 15 CW and one on 17 meters SSB. The total was 17 contacts which will net a POTA activation. I had good conversations with the Park staff and a camper from Kentucky. 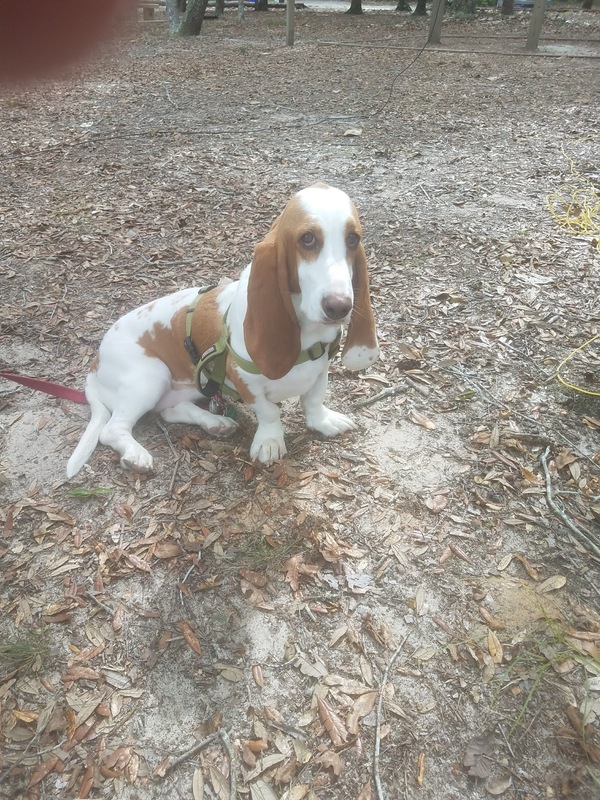 There are plenty of State Parks here in Northwest Florida to activate. My plan is to meet up with Tom WD0HBR from Dothan at Rocky Bayou State Park near Valparaiso, Florida. He will be visiting that area on Saturday, October 21st. I love it when the plan, the weather, and propagation come together! A team from Panama City ARC successfully qualified St Vincent Island, Florida, FL006, for the US Islands Award Program on Saturday, Sept 30th. The team members included Jim K4LIX, Bob WB8PAF, Bob KK4DIV, Phil N4STC, Greg KG4LFS, Dennis WA6QKN and Greg N4KGL. The qualification required 25 contacts. However, the team made 128 contacts in just over two hours including 29 states, Canada, Germany, and Belgium. The contacts also counted for Parks On The Air KFF-0257. St. Vincent is only accessible by boat. The team used the St. Vincent Island Shuttle to get to the island. Our time was limited to four hours on the island and two hours operating time. The team is eager to do more expeditions. I chose to take the Icom 7100, a Bioenno 40 AH battery and my 100-foot loop matched with the Icom AH-4 Tuner. This combination worked fine business on 40 meters and 20 meters. We were making one contact per minute average. We made 50 contacts on 40 meters to my surprise. 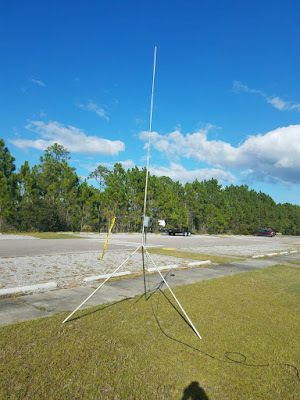 It helped we got mentioned on the North Florida HF Traffic Net. It also helped that the recent solar activity had the SFI at 90 and the critical frequency was above 7 MHz. 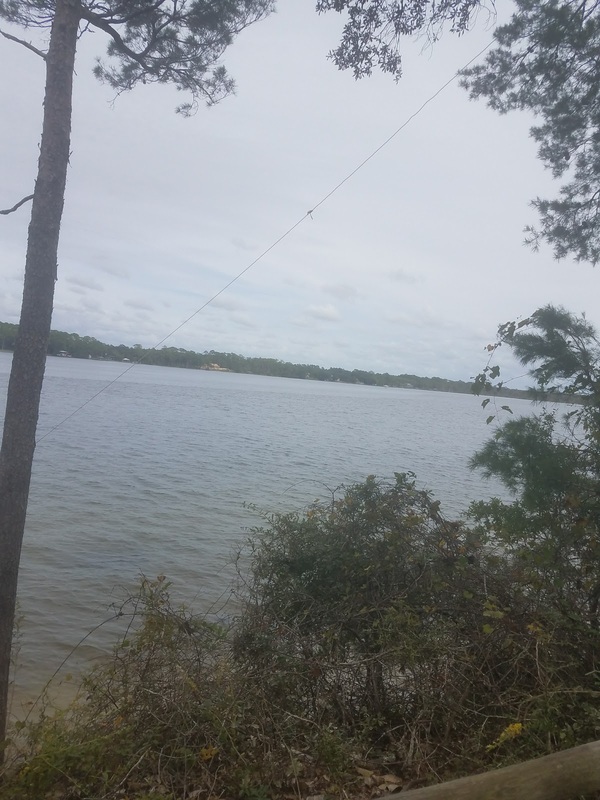 It was easy to make the short contacts back to Panama City and neighboring counties. The 100 ft loop is 30 feet across, 20 feet high and the bottom is 10 feet above the ground. It has proved itself as an all-around performer since the last Field Day. The footprint is 30 feet long which was chosen to fit in a camping spot at Falling Waters State Park. Thanks to the team for making this expedition a success! The Icom AH-4 tuner matches the loop at the center bottom via a short 300-ohm feedline. The base of the Icom 7100 and the Bioenno 40 AH battery. Bob WB*PAF operates and Dennis WA6QKN logs. It will be the closest I have come to a DXpedition. 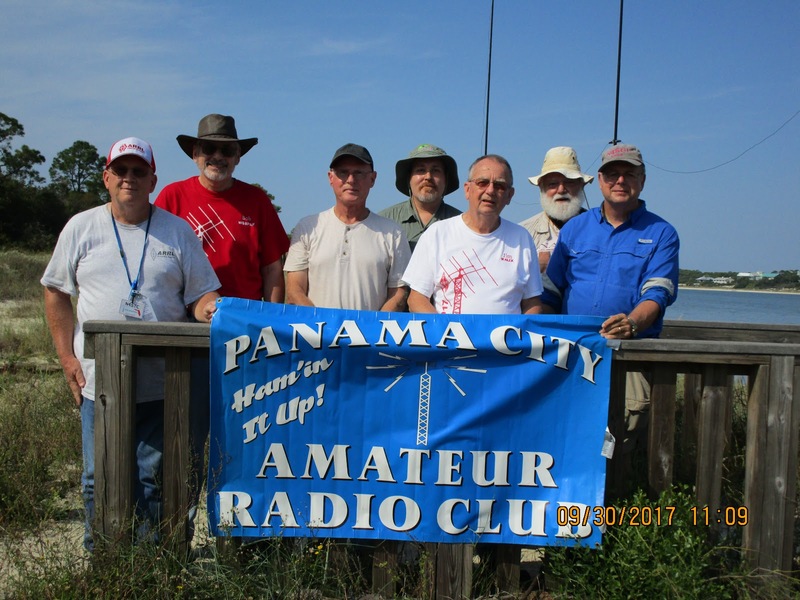 The Panama City ARC is planning to qualify St. Vincent Island, Florida on Sept 30 13:00 - 15:00 UTC. The call will be W4RYZ. We will call CQ US Islands Florida New until 25 contacts. Then we will use FL006. The Island is also Parks On The Air KFF-0257. We will operate primarily 40 and 20 SSB. Other bands and modes will be used based on openings. Qualification means we are the first to operate from the island for the US Islands Awards Program. We need at least 25 contacts to qualify the island, We have a team of seven club members going. We will have two or more stations running. Access to the Island is only by boat. We will take the St. Vincent Island Shuttle from the Indian Pass landing. This is is one in a series of tests using WSPRlite Beacons to study the Salt Water Effect. 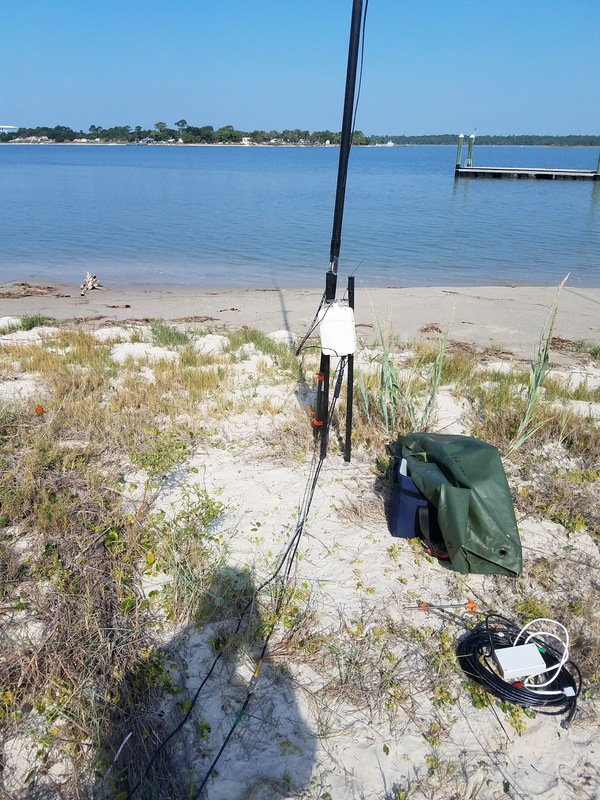 The Salt Water Effect is gaining a propagation advantage by placing vertically polarized antennas near the salt water shore.I often setup on the salt water shore with good results. However, now I am experimenting with a WSPR test methodology to quantify the effect. WSPR is Weak Signal Propagation Reporter. This test was intended to show that two Chameleon F Loop magnetic loops are similar in their WSPR spots. 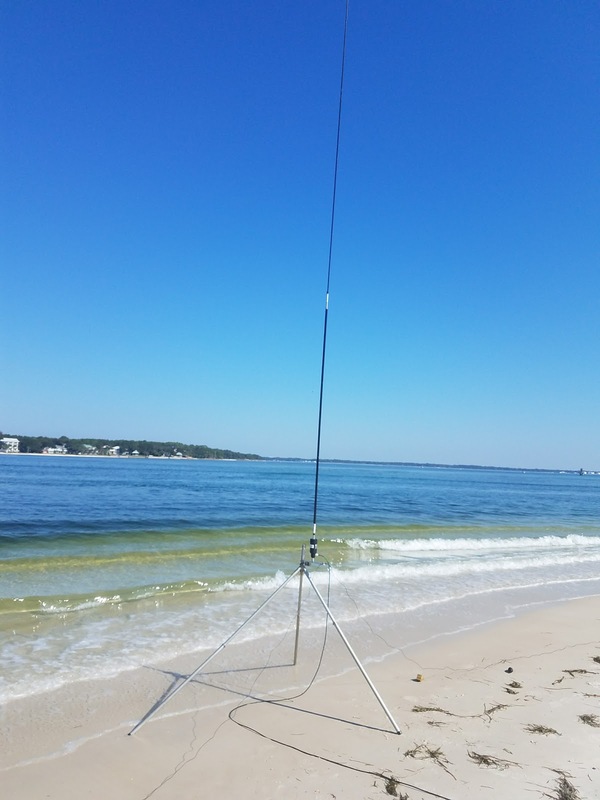 This is a precursor to doing a WSPR test that places one loop at the salt water shore and one inland. I placed my loop and one provided by Bob KK4DIV on the field at Kinsaul Park in Lynn Haven Florida. I spaced them out at some distance from the bay and far enough apart not to have interaction between the two antennas. 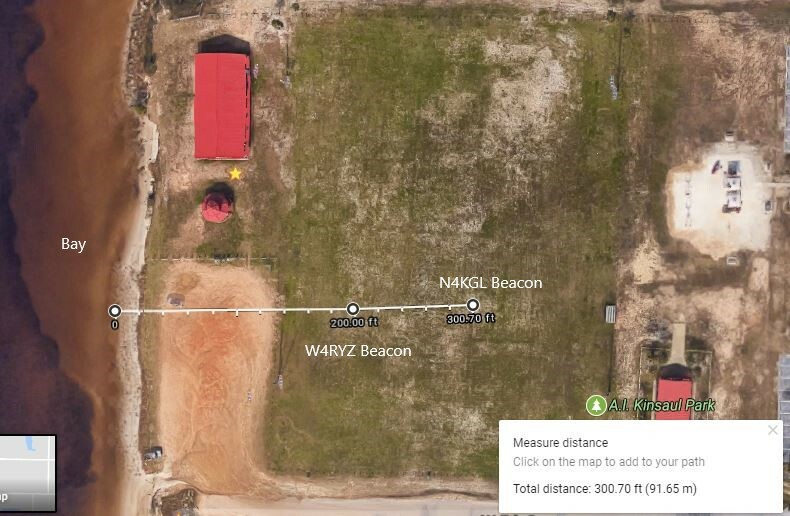 Note, I have upgraded the firmware of my WSPRlite beacons so that if they are started at the same even minute their transmissions will be synchronized. This will enhance the credibility of the results. Also, we lost lots of time because one loop was tuned to 30 meters instead of 20 meters. This was Greg's Boo Boo. Of course, it was a good trouble shooting exercise. Thanks to Bob KK4DIV and Cory N4UVR for their assistance on the field! There were eight transmissions from the two beacons over the course of an hour. 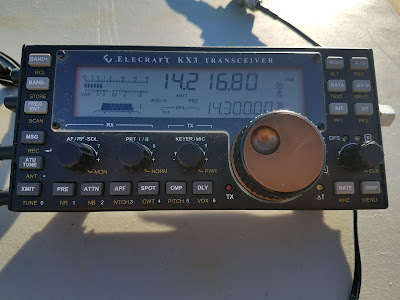 Unfortunately, there seems to have been interference on the N4KGL beacon during the second half of the test. The delta of the average SNR for simultaneous spots is shown above for N4KGL - W4RYZ. The numbers on the header are the deltas in decibels. Eight out of the twelve values are within two dB. 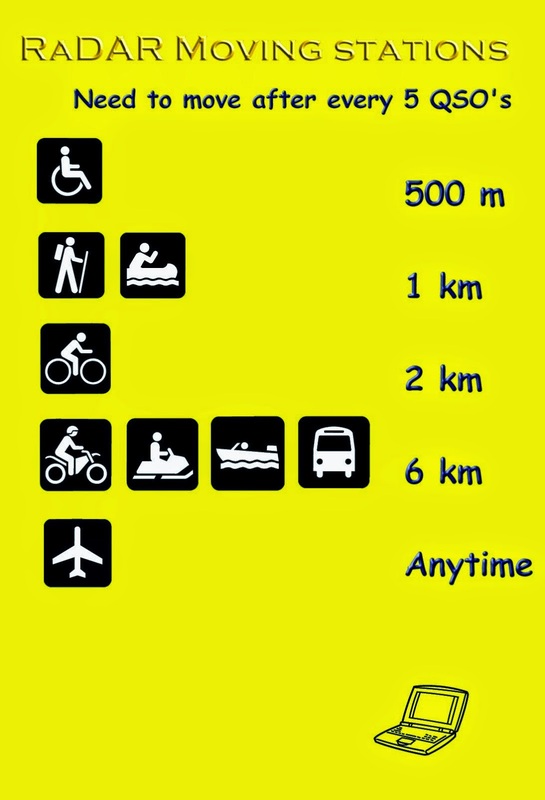 Below are the values for the distance bins in kilometers. 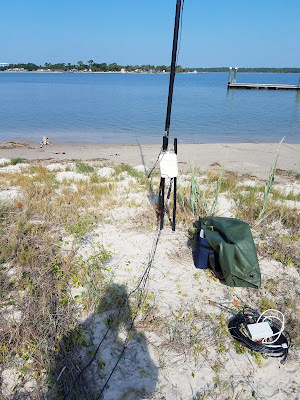 I will use a view like the one above to gauge the difference in average SNR when I locate one beacon at the salt water shore and one inland in a future test. I am doing my data analysis in Microsoft Access. I will refine the queries and views as this effort progresses. 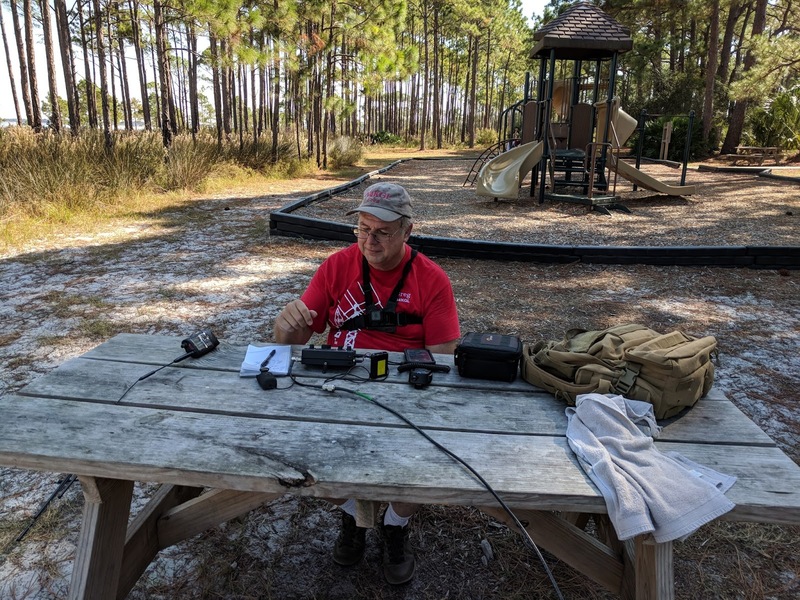 Dennis WA6QKN and I had lots of ham radio fun on Saturday at the Gulf Islands National Seashore Okaloosa Island Day Use Area near Destin, Florida. The US Islands organization sponsored the W/VE QSO Party that day. Okaloosa Island is US Islands FL003S. Also, this site is part of the National Park System and counts for Parks On The Air as KFF-0661. I was concerned initially when I saw a lot of vehicles at my favorite picnic area. It turns out that Marine recruits were having a drill and picnic before they leave for boot camp. No worries as we had plenty of space for our setup. I choose my vertical oriented 100-foot loop for the antenna. It is the one I built for Field Day. It went up smoothly with the three fiberglass poles. 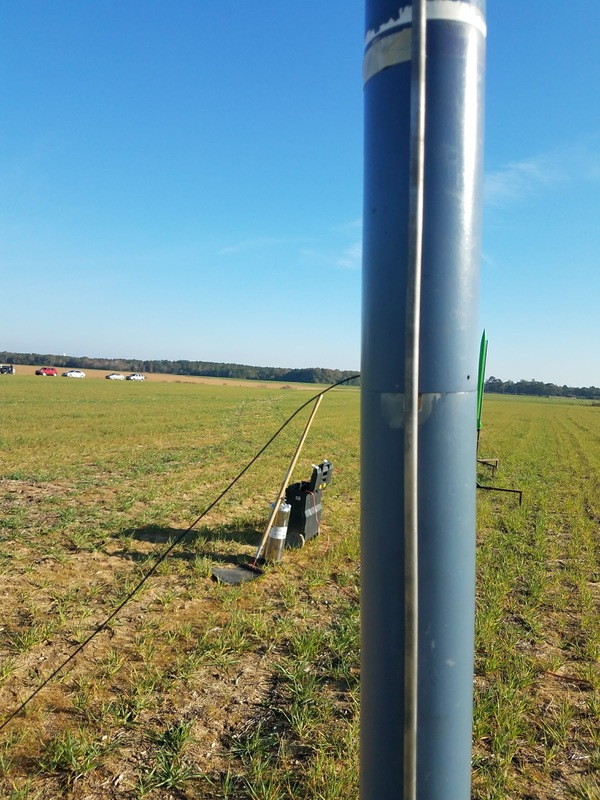 We used a sledgehammer to drive the angle iron stakes for the poles. 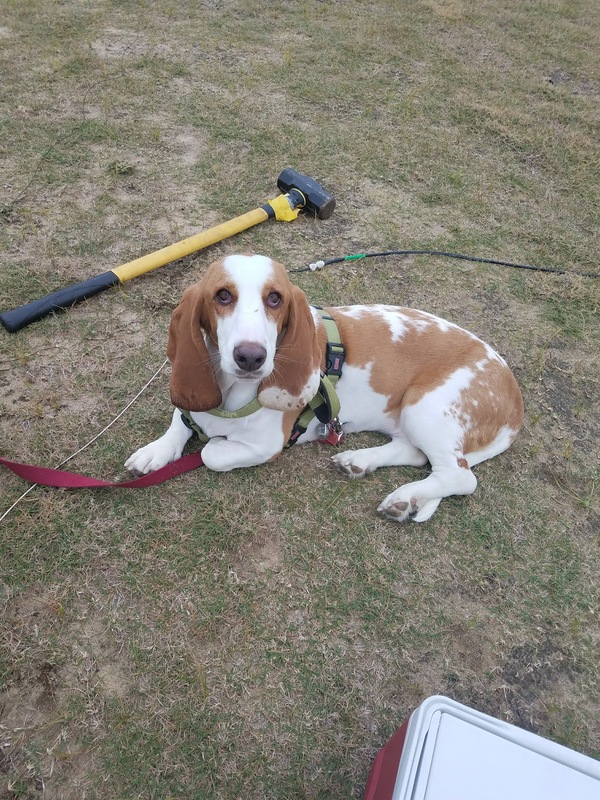 That hammer would be heavy for RaDAR. 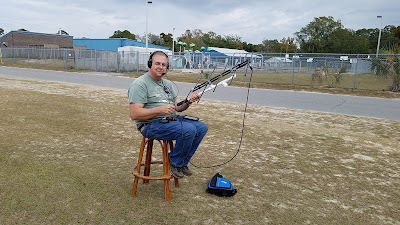 The rig was my Icom 7100 running 100 watts using a 40 AH Bioenno LiFePO4 battery. An AH-4 tuner matches the loop impedance to 50 ohms for the rig. I am pleased with the ease of erecting the loop and antenna. 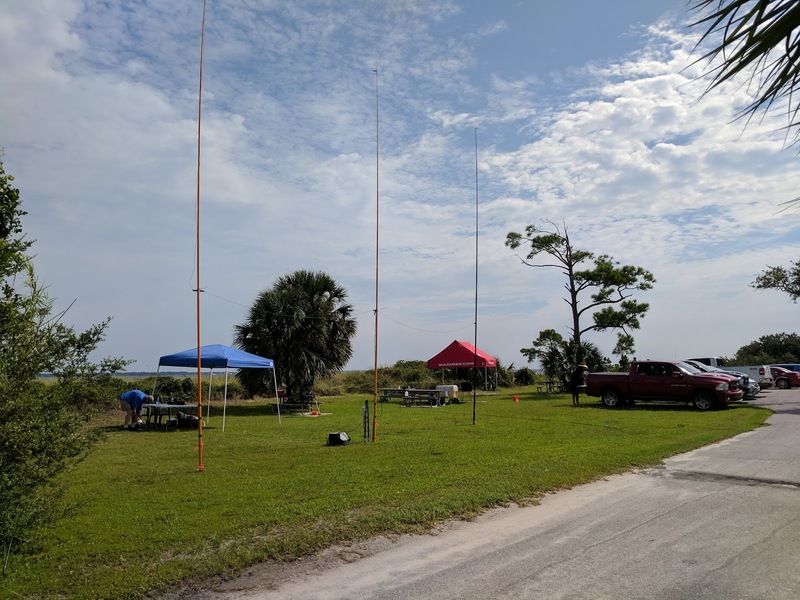 It did a great job on 40 and 20 meters and even the high bands 17, 15 and 10 meters. The 100 foot horizontally polarized loop antenna used three 31 foot poles for support. As the day went on the bands started sounding decent. We operated only SSB. 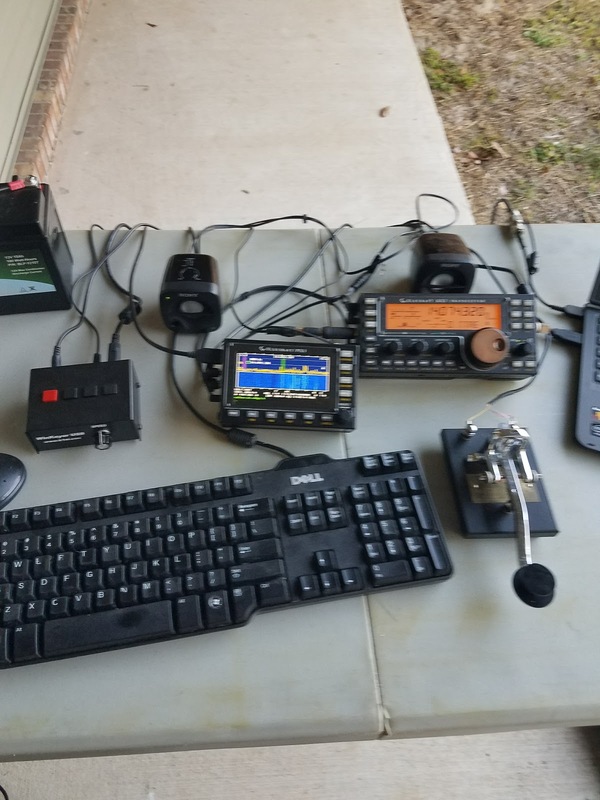 We worked a number of Kansas and Ohio QSO party stations. They dominated the bands. The other W/VE Island stations were hard to find. 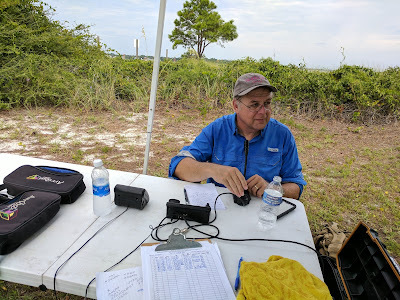 I did get called by Scott ND9E operating from an island in Missouri..Later, I answered a CQ from VA3TIC on an island in Ontario. Dennis saved me the chore of logging all day. That was a great help. Greg N4KGL. Photo by Dennis WA6QKN. 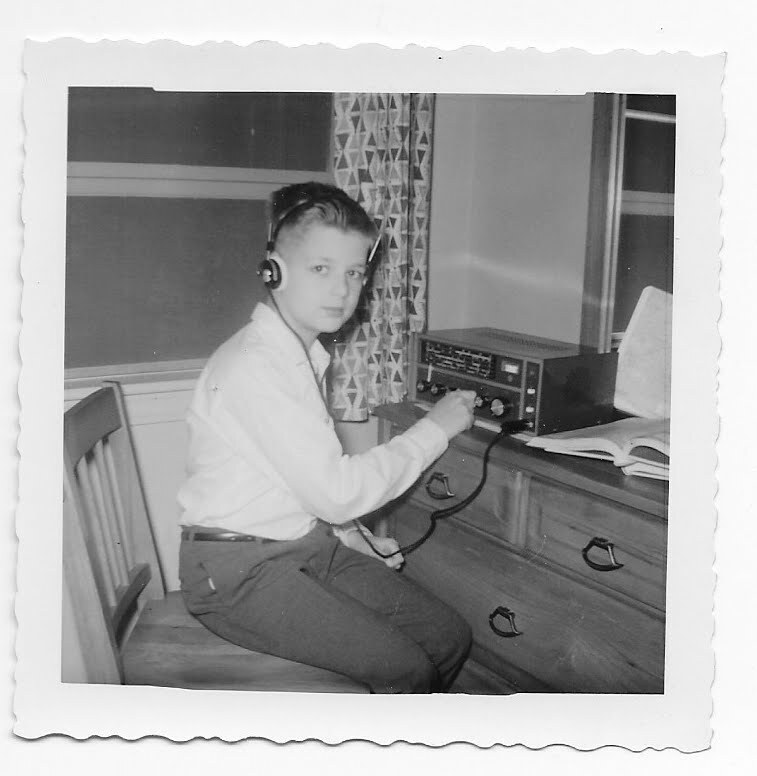 In regard to Parks On The Air, I worked KFF-1077 in Arkansas. That counts for POTA Park to Park. I spotted myself for POTA and a couple of Croatian stations came right back. For grins, we checked the high bands. To my surprise, there was an opening to Brazil on 10 meters! I also worked Suriname on 17 meters. The highlight of the day was snagging KH6TU in Maui Hawaii operating the Hawaii QSO party on 15 meters. 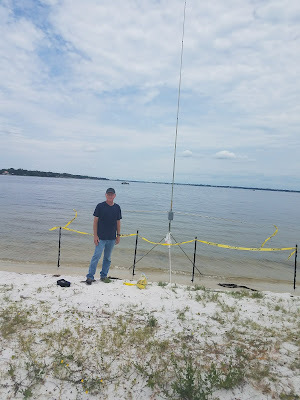 Dennis and I worked in a repeat of the Saltwater Effect experiment with two WSPRlite Beacons and N6BT Bravo 7K verticals. Dennis did a lot of the setup and tear down of the verticals. 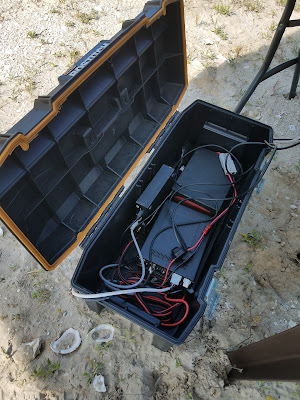 We left one Bravo 7K vertical unattended on the beach at the bay. It was right over the salt water. Fortunately, it did not attract any undue attention. The second vertical was across the park road on a grassy spot. Dennis models the saltwater shore Bravo 7K vertical with a WSPRlite beacon. Of the 66 stations receiving both beacons, all but one had a better average SNR on the salt water shore vertical over the inland vertical. There were 52 stations that copied the salt water shore vertical and did not copy the inland vertical at all. The salt water shore vertical got across the Atlantic and down to Brazil where the inland vertical did not. 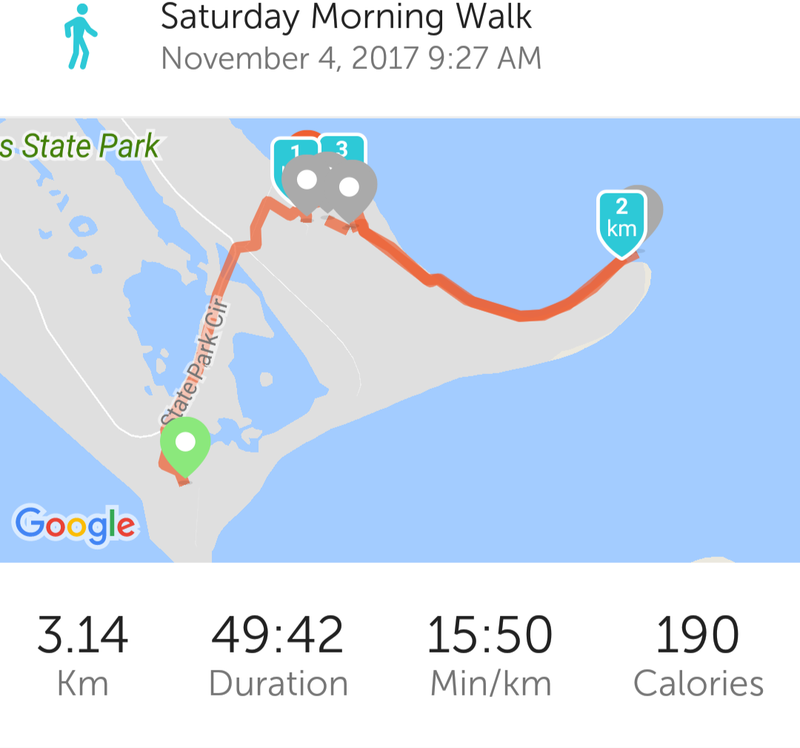 I am getting more and more confident that the salt water effect is real and measurable. The beacon that was a loser in past tests won today. Prior to this test, I measured the output of the beacons into a dummy load and they are both the same. The inland Bravo 7K vertical with a WSPRlite beacon. Despite the sticky weather, Dennis and I had a great day and Suzy did as well. It was well worth the trip from Panama City. I introduced Dennis to the QSO Today Podcasts on the trip home. We listened to Eric Guth 4Z1UG interview Art Bell W6OOB.